Deepika Panthari did her graduation from DAV College. After that she has worked with Axis bank but later on, she left that job to pursue her passion and she has been Playing Keyboard since 2015 at Womania Band. A keyboard instrument is any musical instrument played using a musical keyboard. The most common of these is the piano. Keyboard are widely used in almost all genres of music. 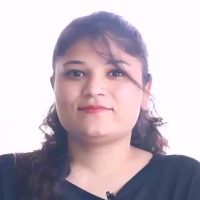 "I have worked with Axis bank but later on, I left my job to pursue my passion and started learning Keyboard and I have been associated with Womania Band as a Keyboard Player since 2015."